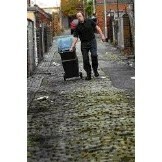 Residents in Fenton, Stoke-On-Trent, have been wondering (rightly) what on earth they pay their council taxes for as they now have to drag their heavy wheelie bins to end of the uneven and cobbled alley behind their houses as the council has changed its collection policy (The Sentinel). "The alleyway is unevenly cobbled to say the least. It has raised ironworks and patches of Tarmac all the way along it and there's a fair share of dog dirt to contend with. "It's just not a suitable surface to be hauling a wheelie bin over, especially when you have a full bin. "There are people who are weaker than me, like the elderly, who are really going to struggle with this, especially in the winter". "I think they have changed their policy because they don't want any of their workforce tripping over on the cobbles. "But we, the ratepayers, don't wear any protective shoes or clothing and we have to drag the bins along." "We pay our council tax for services which we are just not getting".